” WHAT WILL WE DO?” “WHO WILL HELP US?” This is the desperate plea of so many Liberian mothers, especially those who come home from the Refugee Camp in Ghana. 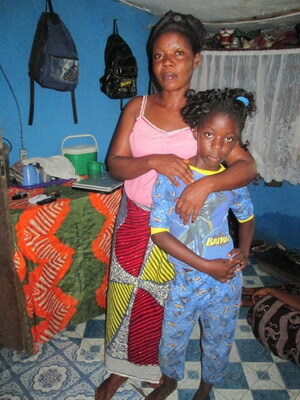 Melvina and her daughter Gifty do not have the funds to pay for another year of rent. Their landlord is threatening to rent their room to someone else. Room rent for this particular room is only $300 for the whole year. That’s $25 per month. In Liberia tenants must pay one year minimum in advance. 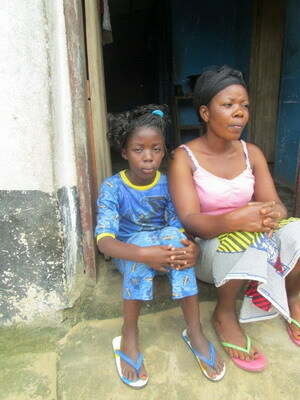 Housing is a major concern in Liberia. Melvina runs a small business and does well to help provide food and clothes. Provision of Hope helped her with a small micro business. Gifty is on our scholarship program and has successfully passed to Gr. 5. Thank you to her sponsors for their monthly support! Yesterday President Ellen Johnson Sirleaf declared Liberia a state of emergency. The deadly Ebola virus is only adding to Melvina’s worries of how they will survive in a land that is still so poor due to years of civil war. Many hospitals are shut down. Schools are not opening. Businesses are not operating like usual. There is no running water. People are full of panic and fear. The World Health Organization is trying their best to contain this virus. Yet it keeps spreading. There is still no cure. How will it stop? President Ellen is calling her nation to 3 days of fasting and prayer. Read more here. Gifty and Melvina are sitting on their door step hoping they will not lose their home. Provision of Hope has been assisting Melvina and her daughter Gifty since we met them on the refugee camp in Ghana. We assist many single mothers. In October of 2009 we helped them resettle back to Liberia. Patrick, Melvina’s oldest son, came to live in My Father’s House earlier, in order to start Gr. 10 on our scholarship program. Patrick is in university today studying Social Work. On his last report card, he had an “A” !! Room rentals are always in our face. I only wish we could help everyone. In 2013 we rented 25 rooms or homes for families and individuals. We spent $10,717 US in room rentals. Already this year we are at $ 11,552 US. Before this month is finished we are sure to have someone else asking for room rent. These are the desperate ones! If anyone would like to help with room rentals we would “really” appreciate your help. Provision of Hope carefully monitors the room rentals. We send our leaders out to make the payments, and get the receipts. We screen who is eligible for this. We are always promoting sustainability and helping those who are doing something to help themselves. “Oh mum, may the good Lord richly bless u with His abandant blessings. I am so excited and i don’t know how to express my joy. May u never lack anything, may u live and enjoyed the fruits of ur labour, long life is ur portion, may ur entire household be bless. May the good God also increase u in wisdom and strength. I am greateful to the Almighty for using u to be a blessings to this family, I pray that He will fill up every gap in ur life with blessing. Provision of Hope’s Team Leader Linda Jarbah recommended that we help this family next. We rely on those on the ground to help us make wise decisions.